The convenience and affordability of disposable, single-use cameras makes them very popular. eCameraFilms carries cheap disposable digital cameras from Fujifilm, Kodak, Snap Snap and more, all trusted brands that promise excellent photo quality. These ready-to-use cameras are affordable and convenient for photography enthusiasts, and they make great first camera options for kids as well. Developing your disposable photos is easy and provides you with physical copies of your favorite photos for framing and display. If you’re looking to buy single-use cameras in bulk, keep in mind that we offer several types of specialty disposables, including the best disposable underwater cameras, 35mm, digital cameras for better-quality digital developing, themed cameras for special occasions, film with included English- and Spanish-language messages and much, much more. Explore our selection for an undeniably affordable, popular and easy-to-use photography solution! Pocket Shot Image HD Disposable FLASH Camera 27exp. UNDERWATER CAMERA 400 Speed / 27 exp. Take superb High Definition photos with our new IMAGE HD 35mm single-use camera. Use it in the rain, on the slopes, on a boat or in the ocean. The QuickSnap Flash 400 camera features a compact body and comes pre-loaded with Fujicolor 400 speed film. This One-Time-Use camera produces very sharp pictures and features a 10-foot built in flash. The QuickSnap Flash 400 camera is fun & easy to use, and is great for taking pictures indoors or outdoors. The continuous flash switch makes it easier to take multiple shots, letting you concentrate entirely on the pictures! What film ISO/speed is loaded into your QuickSnap One-Time-Use Cameras? For the best results in either daylight or flash photography, Fujicolor 35mm QuickSnap one-time-use cameras are loaded with Fujicolor Superia X-TRA ISO 400 Color Print Film. How many exposures are available with your Fujicolor QuickSnaps? Our 35mm format QuickSnaps contain 27 exposures. Let your guests help you capture memories from your special day with this simple-to-use 35mm disposable camera. Make a splash...and don't worry about it! This Kodak disposable camera is waterproof to 50 feet! Create your own fully custom, colorful camera. A crystal clear shell accentuates your full color design. Use it in the rain, on the slopes, on a boat or in the ocean. Take great pictures anywhere, anytime. SnapSights Sports All Weather is the perfect all-weather camera for an active lifestyle. The Kodak 35mm One-Time-Use Disposable Camera has 27 exposures. It is lightweight and can be used both indoors and outdoors. One of our most popular wedding cameras, this pocket-sized, ergonomic model is easy to use and attractive. Preloaded with quality 400 speed film and built-in flash. Disposable Patriotic Flag Camera The Vivitar V69379 is the perfect digital camera for the beginner. It is a 3-in-1 camera, that can take over 200 photos, shoot video clips, and even act as a webcam for video chatting over the internet. You don't need to spend $300 on a digital camera to get digital photos. 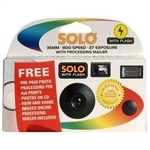 Get the benefits of digital photography--easily and inexpensively--along with your traditional prints with the Solo Plus Digital single-use camera. Be sure to check out our custom disposable digital cameras. These single use cameras are available with custom full color graphics – a perfect promotional product!